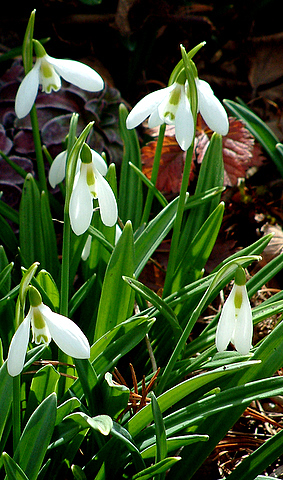 In my previous posting, I described a number of so-called “minor bulbs” that can have a major impact in the late winter garden. This time, I’ll focus on how to grow them. You have to plan ahead to enjoy these little beauties. They all need to be planted in the fall, early enough so that they put out some root growth before the ground freezes. Most aren’t easy to find at local stores, and must be ordered from a catalog or online. I prefer to make my decisions on next year’s order while this year’s plants are in bloom. Unlike the giant hybrids, these bulbs should increase year after year. Since they will be left undisturbed during that time, preparing the soil before planting is especially critical. Nothing lifts our spirits like the first crocuses of spring. They are popping up all over town, like bright Easter eggs in our dreary gardens. After months of plants that are brown and lifeless, spring blooming bulbs are an almost magical treat. Everyone is familiar with tulips and daffodils, and crocuses and hyacinths are recognizable as well, but the assortment of bulbs available to high altitude gardens extends past these familiar flowers. 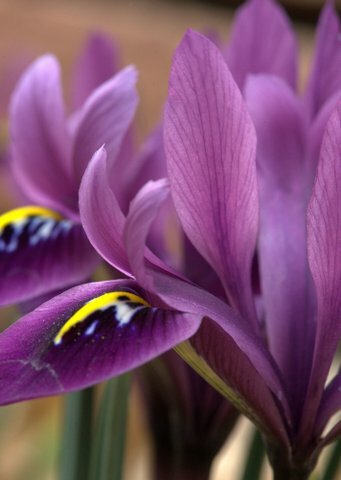 The following flowers are classified as “minor bulbs,” perhaps due to their diminutive size, but they can have a major impact when planted in large enough numbers. In our part of the world, water use is a huge issue. Western gardeners need to take their garden planning one step further, and think of plant materials in terms of their water needs. Many of our traditional garden trees, shrubs, and flowers come from areas of high rainfall, such as the eastern United States and Europe. They need more water than they will receive naturally in this area. In order to keep them healthy, we have to irrigate on a regular basis. This puts a strain on our limited water resources. Instead of buying the same old plants, why not take advantage of our distinctive western climate and grow plants suited for Colorado? Too many times I find myself wandering around my yard, holding a new plant in its pot, wondering where I can squeeze it into my landscape. While those impulse buys are a lot of fun, that’s probably not the best way to go about adding plants to a garden. It’s best to consider the size, shape, and color of a plant first, before trying to determine what exact species is best. Consider how nature positions plants. In any forested area, trees form the highest canopy. They reach up to capture the full brunt of the sun pouring down on them, and provide shade in varying degrees to the plants underneath. When contemplating a garden design, I ask myself: What do I really want in my yard? What features are permanent, and what am I willing to change? How do I want to use my outdoor space? What feelings do I want to experience when I step out my door? After dreaming about blooming zinnias and vine-ripened tomatoes, I woke up and looked out the window this morning. Yup, still winter. What’s a frustrated gardener to do? Winter is actually the ideal time to think about spring. This is the best time of year to design a new garden, or improve upon the one you already have. With all the foliage out of the way, the bare bones of the garden show clearly. Is there still a sense of design to the landscape, even without growing plants? Is some of last summer’s growth still attractive in its dried and dead state? What about interesting bark or seed pods? Dried berries and other fruits? Bare branches form winter sculptures. Look at your dormant landscape—do you like what you see?